We can unpackage Chester's thoughts about the Rubik's Cube and how he solves it so quickly by applying mathematical structure to the cube. However, we should ask: what is the objective? What are we trying to do? There's gobs and gobs of mathematics wrapped up in speed solving a Rubik's Cube, but if Chester were to pay attention to the procedures he is applying, it would inhibit his ability to solve the cube quickly. But consider this: what if Chester attempts to teach how to solve the cube to another person? What would he have to do? What examples, explanations, and demonstrations would he utilize to teach his pupil speed solving? What implications does this thinking have on teaching mathematics? There would be many features of speed solving the learner may not perceive until Chester brings it to the learner's attention. And if Chester's choices are calculated, deliberate, purposeful... the learner may be helped or hindered dependent upon Chester's ability to communicate his thinking which leads to the automaticity of the procedures he applies to solve the cube. Just like learning how to read or learning how to drive a car, we want to teach learners how to do these tasks so well they become 'automated' at some level. To understand mathematics deeply, I believe it is often necessary to unpackage some of these automated tasks. I will share an example of such a mental exercise below. Just another equally valid path to the value of the x-intercept. I'd like to focus on something in one of the above lines. This statement says five-thirds of some mystery number is seven-thirds. So, what's the mystery number? I think if we asked a room full of high school math teachers to draw a diagram explaining why we multiply each side of this equation by the multiplicative inverse of 5/3, namely 3/5, we would get some really surprising results. It's not an indictment of teacher education. Rather, it's to say some teachers may not have considered the how's and why's of this procedure before for the same reason someone learning to speed solve a Rubik's Cube may miss a key structure. They may not have the experience of needing to know why it works. Rather, it was more important that they can find the x-intercept of the line; the multiplication by the multiplicative inverse was viewed as "below" the task or level at hand. Perhaps a student never asked "why?" at the critical moment to give the teacher pause. Below is an image of the fraction diagram I constructed using Geogebra. When stating the equation , we should think of it as a verbal statement: "Seven-thirds is five-thirds of what mystery number?" Well, if the green polygon represents a whole, then the orange polygon is one-and-two-thirds of that whole. Then the green area of 1.4, which equals 7/5, corresponds to the solution. Mentally, how in the world did I end up with fifths, then? 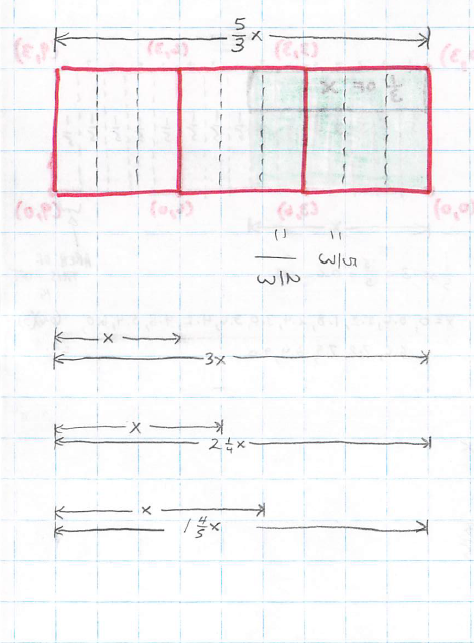 How did I know to cut the horizontal into fifths using vectors and vertical lines in the coordinate plane? We can think of a fraction in the most basic way. Consider 5/3. If the denominator indicates the number of pieces we partition from a whole, and the numerator indicates how many pieces we possess, then I knew we needed to cut the orange rectangle in a way that would make five pieces. It gets to the root cause of WHY we invert and multiply. The numerator 5 becomes the desired number of pieces, considered in a denominator. For the sake of time, I will stop my mental exercise there. Between working the problem, generating the fraction diagram by hand and on Geogebra, and typing this up, I've spent about two hours roughly on this article. This professional development is incredibly powerful for me as a teacher, and it's absolutely free (well, not quite free, I do pay for the website hosting, but you get the idea). Let's end by stirring the discussion pot. Consider our understanding of how to find the x-intercept of the given line. 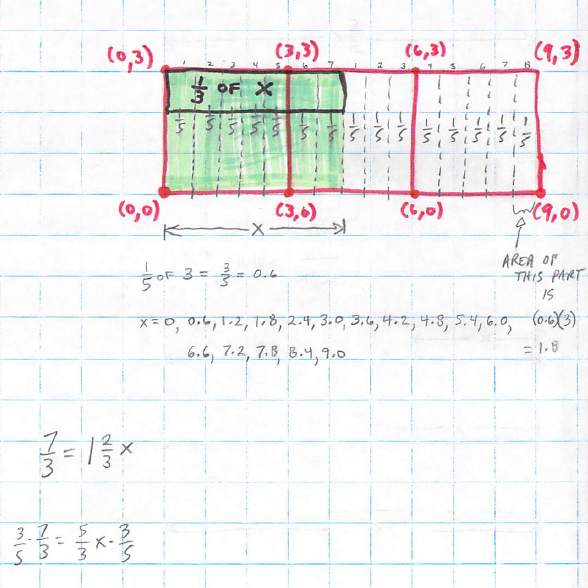 Does our understanding, or lack of understanding, of the fraction diagram and how to construct the fraction diagram (essentially "invert and multiply" in many high school classrooms) inhibit our ability to solve the original problem? Is it still possible to understand the original solution without knowing all the nuts and bolts of the fraction procedure? Stephen Wolfram argues in favor of using computers to automate trivial computation procedures to help us access problems in the world outside school. How will our teaching of mathematics change as computers continue to become faster and more powerful? Posted in Algebra, Professional Development, Teacher Resources, Teacher Think-Alouds, Technology, Uncategorized on December 26, 2013 by Shelby Aaberg.